As Milan is THE CITY of fashion there are lots of places to go shopping, especially for shopping deluxe, e.g. Via Montenapoleone (Gucci, Versace, Fratelli Rossetti, Prada, Cartier etc. ), Via della Spiga (D&G, Sergio Rossi, Tod's, Bulgari etc.) Via Sant'Andrea (Chanel, Armani, Moschino, Kenzo etc. ), Via Manzoni, Via Borgospesso and Via Santo Spirito. The elegant Via Manzoni is home to Spazio Armani at no. 31. This is the Giorgio Armani multi-concept store where you can admire the Emporio Armani showrooms, Armani casa, and Armani fiori. You can also have an aperitif at the Emporio Armani Cafè or spend an evening at the restaurant Nobu, with a dinner by the best Japanese chef to emerge in the last 10 years: Nobuyuki Matsuhisa who opened this chain of restaurants together with Robert de Niro. Around Milan you can go shopping at the outlet malls to have the same luxury feeling with all those designer brands but for less money. Sales take place in July and in January. The winter sales usually begin on 7th January. If you like Italian Fashion brands discover Outlets in Italy, a very useful resource where you can find your favorite Mall and Outlet in Milan and in the surrounding area (Fashion Outlets in Lombardy), and all the Factory Outlets in Italy. And don't forget that at only 1 hour from Milan you can find the Fidenza Village Factory Outlet, a big outlet with 50 stores: from clothing to home furnishing brands. To go shopping without spending all your money there are four important streets in Milan: Corso Vittorio Emanuele, Corso Buenos Aires, Via Torino and Corso di Porta Ticinese. Corso Vittorio Emanuele with Piazza San Babila, starts with the department store Rinascente, the monument to Milanese shopping that owes its name to Gabriele d'Annunzio. In Corso Vittorio Emanuele there are sophisticated label shops, such as Max Mara, Moreschi, Bruno Magli and Pollini, but there are also more popular labels such as H&M, Zara and Furla. Corso Buenos Aires, that is one of the longest streets in Europe, connects Porta Venezia with Piazzale Loreto and it is even more commercial: there are Timberland, Mandarina Duck, Benetton, Kookai and Nara Camice. Via Torino connects the Duomo and Corso di Porta Ticinese, is more for younger people and the casual style is sportier, with Foot Looker, Camper and Energy stores. The closer you come to the Navigli area, which is the temple of street-style, the more the store scenario varies. Corso di Porta Ticinese, which becomes Via Torino that takes you right up to Piazza XXIV Maggio, is the right place for those “alternative” purchases: Custo–Barcellona, Diesel, Miss Sixteen, Gas and Fornarina stand alongside second-hand clothes shops, stores with bizarre objects for the home, handmade clothes and accessory stores. Afternoon shopping tour from Milan to Switzerland at Foxtown outlets with over 130 stores to choose from which offer discount between 30–70% off the recommended retail price. And after engaging in some serious retail therapy you will have the possibility to choose among head for the beauty center for some pampering, explore the numerous bars or try your luck at the Gran Casino Admiral, all under one roof! 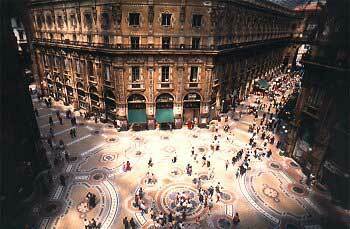 Full day shopping tour from Milan to Serravalle Designer Outlet Europe's largest and Italy's leading shopping mall. Wide range of clothing, footwear, home furnishing and cosmetics, all discounted between 30–70% off the recommended retail price. Corso Buenos Aires, 51. Multi brand store Versace, Trussardi, Cavalli. Corso Buenos Aires 59 (MM1 Lima). Garments for men and women, various brands. Galleria San Carlo (off Corso Vittorio Emanuele, near number 24 of this street, MM1 S. Babila). Opening Hours: 10.30–14.00, 15.30–19.30, closed Sunday and Monday morning. Max Mara collections from previous seasons. Via Spartaco 3 (bus 84). Opening Hours: 10.00–13.45, 14.45–19.00, Saturday 10.00–13.45 only, closed Sunday and Monday morning. Multi brand store with several locations: Via Vincenzo Monti 47, Via Belfiore 7, Via Lorenteggio 55, Corso Genova 15. Via Torino, 34. Casual clothing. Via Fratelli Bronzetti 16 (MM1 Lima then bus 60). Opening Hours 10.00-12.00, 15.00-19.00, closed Sunday and Monday morning. Opening Hours on Wednesday and Saturday 10.00-19.00. Two floors, designer clothes for men and women, most of the major Italian designers and a few French and American brands. Via B. Corio 3 (MM3 Porta Romana). Open Monday–Friday 8.30–12.30, 13.30–17.30, Leather goods, a huge assortment of bags, suitcases, accessories. On the other side of this store there is a Football Corner which offers football shirts, boots, accessories etc., official team merchandise. Via Martinetti 6 (MM1 Gambara). Open Tuesday-Saturday 9.30–12.30, 15.00–19.30. Factory outlet with a selection of Italian shoes for men and women. Via Ramazzini 11/Piazza Lavater (MM1 Porta Venezia). Opening Hours: 10.00–13.00, 15.30–19.30, Saturday 10.00-19.00, closed Sunday and Monday morning. A small store with designer garments for men, women and children. Via Provinciale per Bregnano 12, Vertemate con Minoprio (about 15 km south of Como). Opening Hours: 9.30–19.00, closed Sunday and Monday morning. Three floors of Armani, Emporio, Jeans, for men and women. Open Monday–Saturday 9.30–19.30, Sunday 11.00–20.00. Garments, textiles for clothing and furnishing, accessories, by Mantero, which is a historic silk manufacturer in Como. This new store is in part of Mantero's factory premises, specially restored with spectacular interiors, including a café. Via Cernobbio 17, Como. Open Tuesday–Saturday 9.30–18.15. Items in silk and other fine fibres by this famous Como manufacturer. Via del Seprio 54, Lomazzo (south of Como). Open Monday–Friday 9.30–12.00, 14.00–19.30. Factory shop run by this brand, also products made for other labels. Via Cantù 234, Parabiago (near Milan). It has only shoes for sale.